A table saw is not only the most fundamental but also the most useful tool in any woodworker’s arsenal. As such, choosing one is not a decision that should be taken lightly. 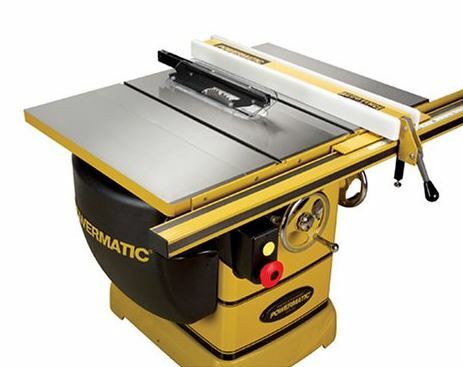 Whether you’re a professional contractor or just an aspiring hobbyist, chances are that you have heard a lot about Powermatic. Why do so many woodworkers swear by their saws? Well, the first thing folks look for in any tool is reliability, and it has been America’s leading manufacturer for almost a century. Of course, even if you’ve already decided to join the ranks of proud Powermatic owners, you still have a lot to consider. 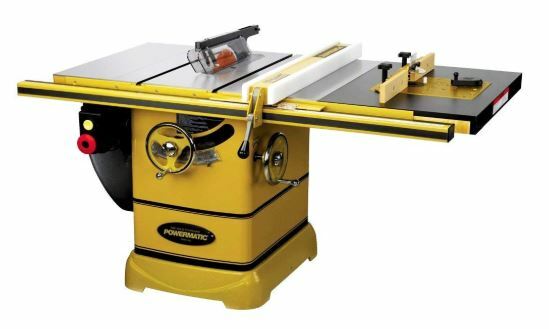 There are 21 different models to choose from, and only one is perfectly suited for your needs.So, before you make up your mind, you should carefully consider each of the six best product from Powermatic has to offer. Also known as the “fully loaded” PM2000 model, the 1792006K features all of the unique and innovative features the brand is famous for. That includes their smooth Poly-V drive belts, a melamine-coated extension table, and the Rout-R-Lift system. Its wide-stance trunnion and patented Accu-Fence System allow for stable, accurate cutting action for hours on end. And thanks to an adjustable bevel angle indicator, you can make countless bevel cuts without readjusting the angle. Plus, with 50 inches of cutting capacity and a 13-inch aluminum extension fence, you can easily make continuous miter cuts as well. Designed with precision in mind, it is adjusted by chrome plated, extra-heavy hand wheels for the smoothest arbor/trunnion movement possible. Meanwhile, its quick-release knife mechanism, kickback pawls, and an independent leaf blade guard ensure safe operation. The 1792006K is set in a heavy-duty cast iron base to provide stability and minimize noise. In fact, it is so quiet that you almost forget it’s powered by an industrial-class 5HP motor. That is, of course, until you see it cut through oak like a hot knife through butter. Packing more power than any other products, the PM3000 is the company’s first and only 14-inch model. Aside from a 7.5HP 460V motor, it comes with cast iron support legs and a 33-inch Duramine extension table. Plus, as with all industrial units, the Accu-Fence system and heavy-duty wings are also included. Although the weight and size of this model may make it seem unfit for a hobbyist, the 1720305K is actually quite user-friendly. Both the blade guard and the riveting knife have Quick Release switches for changing the blade with no tools necessary. Likewise, there’s an arbor lock mechanism, which eliminates the need for arbor wrenches. Still, practically speaking, most folks don’t have much use for all that horsepower or even for the longer blade. But let’s be honest – using this would be a whole lot of fun. So, if you need to do a job that a 10-inch blade can’t handle, or you can afford to spend the extra cash, definitely consider the PM3000. While this PM2000 cabinet saw isn’t as powerful as the 5HP version, it is still very much an industrial-class power tool. The left-tilting model even comes with a 50-inch fence and support legs to handle large workloads. Sure, some cuts may take a bit longer to complete but the results can easily be as precise and smooth as possible. Normally, a smaller motor implies much more noise during operation. However, with a 600-pound cast iron base, there’s minimal vibration and even less sound created by the 10-inch model. And, for obvious reasons, it’s relatively energy efficient. Did you know that the 1792000K can fully replace your compound miter saw? With high-precision, adjustable indicators for both miter & bevel angles, you simply dial in the desired measurements and make as many identical cuts as you need. 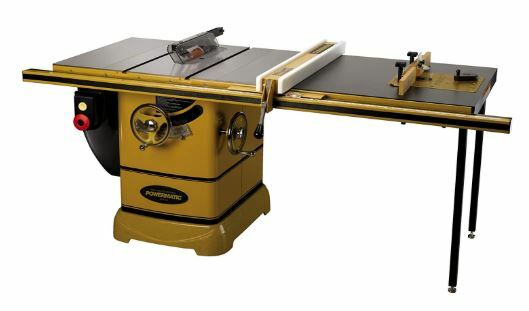 And don’t worry about hitting the miter gauge on the edge of the model because Powermatic thought of everything. They designed the PM2000 with front and rear edge bevel, solving this common, age-old problem once and for good. Another thing worth noting is the integrated debris collection system. There is a built-in 4-inch port and it’s compatible with virtually all dust collectors, regardless of their brand. At just 390 pounds, PM1000 is the most light-weight model. On top of that, it runs on a 1.75HP engine that requires just 115V. Nevertheless, it spins the blade at an impressive 4,200RPM, which makes it more effective than any of its 3HP counterparts. And, though it doesn’t have a thick base for support, the 1791001K is still made from polished cast iron. Each unit comes with a 12-month manufacturer warranty, plus an optional 3 Yeap Protection plan that costs around $200. For the convenience of those who tend to have their hands full (literally), the power switch is located at knee level. In addition to that, you only need one hand to use the arbor lock so changing blades has never been easier. And the redesigned miter & bevel gauges are displayed in large, easy-to-read numbers. The PM1000 cabinet comes standard with regular (kerf) and low-profile riving knives. A 52-inch support table and two rugged side guards are also included. If you’re shopping for your very first power tool, this may be the right option. Due to the fact that it doesn’t come with a support or guards, the 1792002K is perfect for seasoned woodworkers looking to replace or upgrade their units. If you don’t already have a work area set up with a sizable support, you’d probably be better off buying a model that includes one. You can always buy it separately but you’ll save a few hundred bucks by bundling. Thanks to an integrated dust collector, it cuts cleanup time in half. Sawdust slides into the 4-inch port and lands inside the cabinet. The best par is that the cabinet was specially designed with a sloped floor so all the dust ends up in one neat pile. Just like the rest of the PM2000 lineup, the 1792002K guarantees efficiency, precision, and durability for years to come. How many years do you expect it to last? 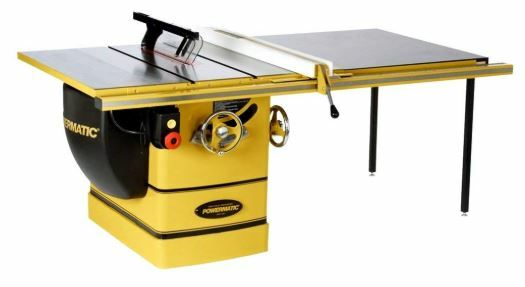 Well, Powermatic includes a warranty of five years with all their heavy-duty model. For a 600-pound piece of equipment, this model is surprisingly versatile and easy to store. A set of built-in retractable wheels allows you to easily move it around the workshop/garage. And, with a short, 30-inch Accu-Fence system, it doesn’t take up much more space than the 30x30in. cabinet base. Powered by a lightweight 1.75HP motor, which can be charged at either 115 or 230 Volts, this 24-inch model can expand to a length of almost six feet. Though it looks like a stool, the 1791229K is one of the best contractor-style models on the market. It enables you to work with thin or thick material without having to worry about possible kickback. How can there be no chance of kickback, especially with such a small engine? You see, the riving knife is maintained within picture-perfect proximity of the blade, blocking all runaway debris. The 1791229K may not be a good fit for heavy everyday use, but you’d be hard-pressed to find a better suited for making crosscuts. It features a best-in-class Micro Adjust miter gauge for precise angle adjustment and a 12-inch extension plate for stability. On top of that, the support table, wings, and guards have beveled edges, assuring a smooth crosscut every single time. All things considered, for most expert woodworkers, a 1.75HP model just doesn’t cut it (no pun intended). However, if you need a model you can store and/or transport, this 340-pound model is a great option. And, if so, you’re definitely going to need a set of attachable castors from the accessory section. While there are a number of formidable models, the 5HP 3-Phase PM2000 (1792006K) is clearly the best all-around product of 2018. The longest extension fence for miter and bevel cuts comes standard with the PM2000. 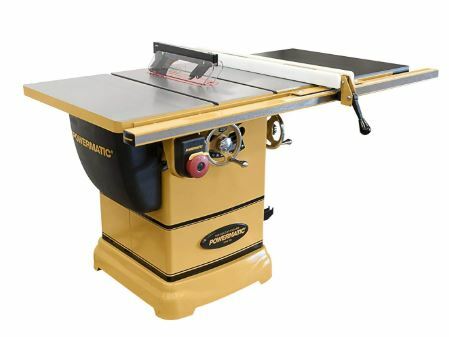 It’s the only model with both a routing table and a micro-adjusting miter gauge. Its TEFC Motor magnetic controls and Quick Release riving knife make it the safest. Unless you want a Powermatic product for a very specific purpose, you’re bound to reach the same conclusion. The 1792006K is simply the best version of the PM2000 line. Meanwhile, the 14-inch PM3000 is overkill and the PM1000 saws aren’t powerful enough for heavy use. 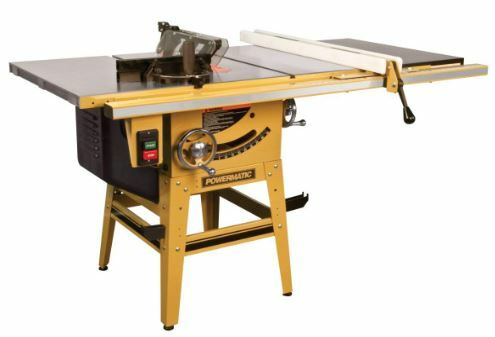 Read about other cabinet table saws at our homepage here.